2.25x12 Wicker Antique Brass Floor Register Discounts Apply ! 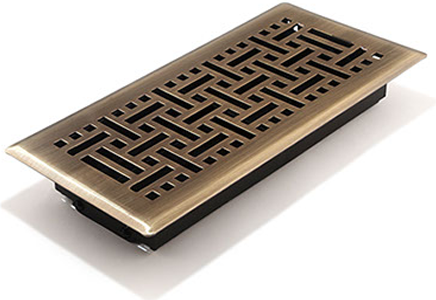 Looking for decorative floor registers to replace old metal floor vents in your home or business? Our decorative floor registers contain an adjustable damper which is made of an ABS resin plastic and allows you to have controlled air flow. Not only are the metal floor vents tarnish and corrosion resistant, the plastic damper is rust proof. Our wicker antique brass decorative floor registers are the ideal option for you. These eye pleasing 2.25 x 12 metal floor vents are made to hold up to 200 pounds. ***Hint: When measuring for your metal floor vents, please measure the actual hole opening and not the existing faceplate dimensions. These antique brass decorative floor register will fit a 2.25 x 12 inch hole opening. 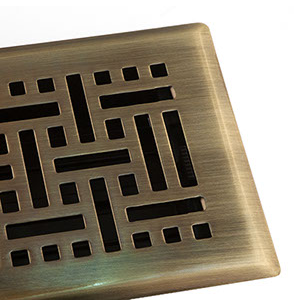 Our antique brass metal floor vents come in numerous sizes and assorted finishes. These wicker decorative floor registers are suitable for any home decor so order yours today!